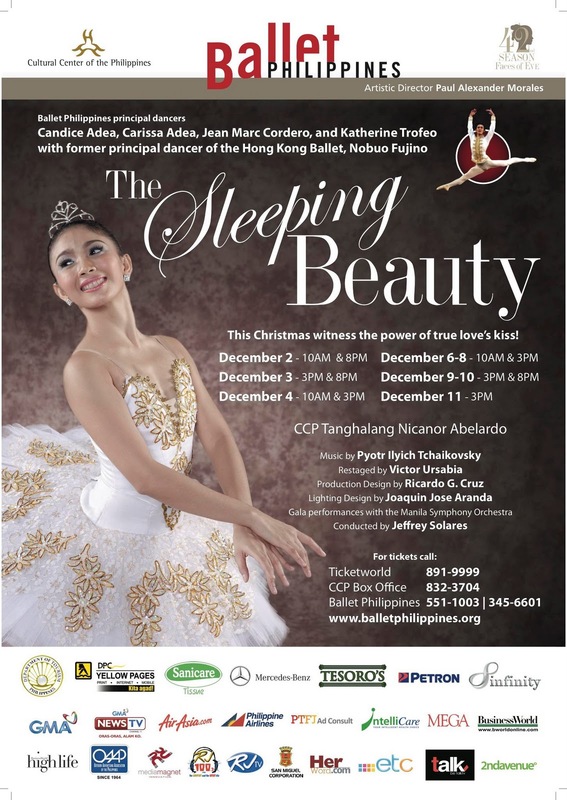 Ballet Philippines presents The Sleeping Beauty at the CCP Main Theater showing on December 8 (Thursday) at 10 AM and 3 PM, December 9 (Friday) at 3 PM and 8 PM and December 11 (Sunday) at 3 PM. The performances on December 10 (Saturday-3PM and 8PM) are sponsored by Bangko Sentral ng Pilipinas Employees Association and Knowledge Channel, respectively. The Manila Symphony Orchestra will play Tchaikovsky's music live for one last time on December 9 at 8 PM, with Katherine Trofeo as Princess Aurora and Jean Marc Cordero as Prince Desire. Principal dancers Candice Adea and Carissa Adea, soloist Richardson Yadao and company member Earl John Arisola also perform the roles of Princess Aurora and Desire on the remaining performances. For more information, visit www.balletphilippines.org or call Ballet Philippines at (632) 551-1003 or 551-0221 or Ticketworld at (632) 891-9999. Follow them on Facebook at http://www.facebook.com/balletphilippines.